You are here: Home » MEDIA » Books » Ancestral Machines (Book Four of Humanity’s Fire) by Michael Cobley (book review). Ancestral Machines (Book Four of Humanity’s Fire) by Michael Cobley (book review). In ‘Ancestral Machines (A Humanity’s Fire Novel book 4)’ by Michael Cobley, trouble comes to the Milky Way galaxy. One hundred thousand years ago in the Greater Shining Galaxy, a galaxy far, far away, they built a marvel of engineering called the Great Harbour of Benevolent Harmony. It comprised two hundred worlds harnessed to an artificial sun all living in love and peace while travelling through space. Then it went bad and became the Warcage. Rumour was that the Just Reprisal Alliance destroyed the Warcage but now it has turned up between Earthsphere and The Indroma Solidarity. You gotta love the names. This novel is set in the world of Cobley’s ‘Humanity’s Fire’ trilogy but you need not have read that as it’s a standalone. Various local powers noticed the Warcage’s arrival and go to investigate. Earthsphere send Lieutenant Commander Samantha Brock and she teams up with Drone Rensik Estimil, an artificial life form sent by The Construct, which rules Hyperspace, more or less. Brock is a standard tough, beautiful heroine but Rensik has a dry sense of humour and I enjoyed his scenes. The Construct has reasoned that tyrannies always have rebel groups. Brock and Rensik’s mission is to find the best of these and help them topple the evil rulers of the Warcage and perhaps restore some benevolent harmony. The other main protagonists are Captain Brandon Pyke and his ragtag crew of misfits. Pyke, a ‘hard-bitten, border-defying, sanctions busting smuggler who laughed in the face of boundary police’ is a typical hero of the big screen ilk and his crew of assorted aliens make good secondary characters. Their dialogue is not dissimilar to the stuff you get in SF action movies. He gets involved with the Warcage when someone from it double-crosses him and then someone else steals his spaceship, the Scarabus. Key amongst the Warcage personnel is Akreen the Zavri, a high-ranking commander among aliens who have sworn loyalty to the ruling Shuskar and have been their best enforcers for centuries. Like some other Zavri, Akreen is equipped with the persona and memories of several of his ancestors who babble away constantly giving advice or sneering according to their wonts. His current mission is to repress the Chainers, a group who have taken the chains of their slavery and made it into a symbol of pride and resistance, as is the fashion. There’s plenty of action-packed plot and lots of chasing around, double-crossing, ship stealing, chases, imprisonment and escapes, as you would expect in a space opera thriller of this type. It’s well done. There is also plenty of invention with loads of gadgets, gizmos, sophisticated nanotechnology software and miniature data probes galore, not to mention weapons, cultures and history. I found it interesting that the top men in the Warcage like Arbiter-General of the Grand Escalade and Shuskar Lord Veshen wear masks. This is similar to the Lords of Granbretan in Moorcock’s ‘Runestaff’ books, indicative, along with the flowery titles, of an ancient and corrupt elite. I don’t know of any real societies where the aristocracy wore masks but the old Persians wore big false beards. The Great Harbour of Benevolent Harmony was torn apart by xenophobic factions whose propaganda raved about largely imaginary injustices concerning law, trade rules and even food production standards. The writer is British. Could this be a metaphor? In any case, the detail raises the novel slightly above the standard ripping yarn. Not that I mind them but it’s nice to have extra ingredients. There’s even fine writing. On page 102, for example: ‘flights of pale stone steps, worn, cracked and rounded that climbed through a dozen decrepit floors’ and ‘dark cloud had dissipated to thin tails strung out across a bleached sky.’ Oddly, given the conventions of modern editors, Cobley uses the passive voice now and then. ‘Harness rations were produced, sampled, swapped’ – ‘water pouches were sparingly sipped from’. Later, ‘hands reached for holstered weapons as eyes turned in the direction of the voice.’ I don’t mind this since many old pulp writers used the passive voice. Robert E. Howard did it a lot. The prose throughout is clear and lucid and you won’t have to read a line twice, except maybe for technical details. 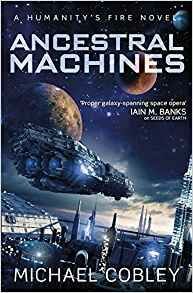 ‘Ancestral Machines’ is a jolly good space opera adventure thriller novel and I recommend it for fans of that genre. Not the thing if you’re seeking realistic characters, deep thought and some insight into the human condition. « Bloodbond May 2018 (e-magazine review).